Establish a Qatari whale shark identification database. Understand the distribution and movements of whale sharks that occur in Qatari waters. Form an estimate of Qatari whale shark abundance, demography and population status. Discover how environmental and biophysical factors influence occurrence. The Research team use a variety of sophisticated and state-of-the-art methods to study whale sharks. Below you will find a list of the methodology used, together with a brief description and some images and videos of the methodology in practice. During the months from May to October, boat surveys are conducted regularly in the Al Shaheen area. The Qatar Coast Guard is assisting the team with their high-powered vessels. During the boat surveys, in water data is collected from the sharks and monitoring equipment is deployed. 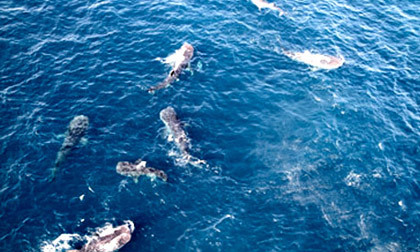 The offshore staff on the Maersk Oil platforms report sightings of whale sharks on a regular basis. The observations are used to guide the researchers during boat surveys and establish the full extent of the whale shark season in Al Shaheen. 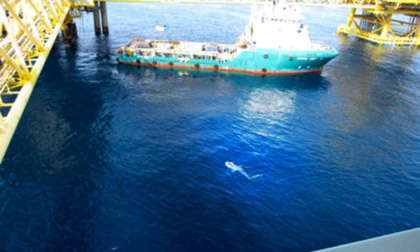 It was the sightings and photos from offshore workers that caught the interest of scientists and eventually led to the establishment of the Qatar Whale Shark Research project. It is often not possible to get a clear picture of the number of sharks in an area from boats. Waves and viewing angles, along with the fact that many of the sharks are below surface, will often result in an underestimation of the numbers. Aerial surveys provide an excellent opportunity to cover larger areas and assess the total number of sharks on any given day. The aerial observations help to provide a better understanding of the total population size and aggregations sites. The first aerial whale shark survey in the Gulf was conducted in September 2012 with the assistance of the Qatar Emiri Air Force. The ability to recognize different individuals is important to determine the population size. The number of times an individual whale shark is re-sighted can be used to estimate how many whale sharks there might be in a certain area and whether the population is growing or shrinking. Repeat length measurements of the same individual can be used to estimate growth rates. Photo-ID involves taking a photograph of the area behind the 5th gill slit and the end of the pectoral fin. The spot pattern in this area is unique for each individual, similar to a human finger print, and stays unchanged during the life span of the shark. A photograph of the spot pattern within this area can be used to identify and distinguish individual sharks. Photo ID has become the most commonly used method of whale shark identification amongst researchers. Using software originally developed for mapping the stars, computer software programs can help researchers to process the images and identify individual whale sharks. These computer programs can narrow down database information containing thousands of sharks to a short-list of 50 of the closest matches. Researchers can then compare the resulting sharks by eye. To date, the QWSP has identified more than 200 sharks based on their spot patterns. Although previously estimated at up to 20 metres in length, accurate size estimates of the giant fish have been difficult to obtain in the past. Researchers claim they have dramatically improved the precision of this method with the addition of two laser pointers. By positioning the lasers 50cm apart on either side of a camera, the distance between the projected points provides a fixed scale. Photographs can then be analysed with greater accuracy. Laser photogrammetry has been found to be a promising new cost-effective technique for measuring free-swimming whale sharks. Photogrammetric measurements are more precise than visual size estimates by experienced researchers. Regular measurements may provide more information about the growth rate and lifecycles of these sea giants. The QWSR team is using different types of satellite tags to follow the movements of the whale sharks in the Gulf. The tags are attached to the shark by using a specially designed pole spear. The tag is tied to a small titanium anchor which is embedded into the thick skin of the shark. The whale shark has a very thick skin thought to be the thickest in the animal kingdom, so the sharks rarely notice that the tags are being attached. The first whale shark was successfully tagged off the coast of Qatar on April 23rd 2011. The shark was an 8m female that we called Amna. Here the team used what is referred to as Pop-up tags or PAT (Pop-up Archival Transmitting) tag. The PAT collects and stores data throughout its deployment. It then releases itself from the animal and floats to the surface after a user-specified time period. Data is then transmitted to the Argos satellite system; the information collected is available without recapturing the animal or recovering the tag. The PAT tags used by QWSR record depth and temperature but also measure light levels. The light levels are used to estimate geographical location. Because day length changes with latitude and, sunrise and sunset times change with longitude, light level data can be analyzed to determine where the shark travelled between PAT deployment and release. Take a look at a whale shark tagging video. The Smart Position or Temperature Transmitting (SPOT) tag transmits a signal to the Argos satellite array whenever it comes to the surface of the water long enough. The tags are therefore attached to the shark with a longer tether and will float if the shark is, for example, feeding at the surface. These transmissions result in geo-location estimates that can be very precise depending on the number of satellites receiving the signal. The researchers are then able to receive a real-time position of the shark and get temperature recordings. Acoustic tags are attached to selected whale sharks in order to follow their movements locally and globally. 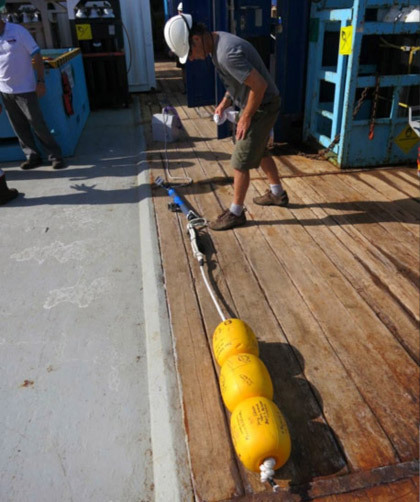 The acoustic tags send out high frequency sounds that can be detected by acoustic receivers deployed on the seabed. If a shark carrying an acoustic tag passes by a receiver within a range of approximately 1000 meters the receiver can record time and depth of that particular shark. The acoustic tag can send signals up to 6 years after being attached to the shark. 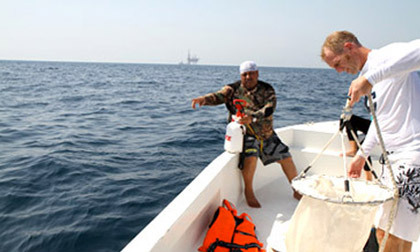 In 2012 the QWSR deployed 15 receivers at selected locations in the Al Shaheen to monitor the movements of the sharks. Similar acoustic receivers are used by other whale shark researchers around the world, creating a global detection network.